Aidan Moore tells me he thinks the NeverEnding Story is a bit of a messed up film. Not excessively so, just enough to weird someone out a little after watching. Fair enough I suppose; perhaps some of the films magic is lost once one passes childhood. I haven’t had a chance to revisit the film in many years; maybe I will have to watch it again soon. One thing that Aidan got out of watching the movie was the name of his band, Moses Gunnn Collective. The actor named Moses Gunn portrayed Cairon in the movie and it was the actor’s name that stuck with Aidan the most. 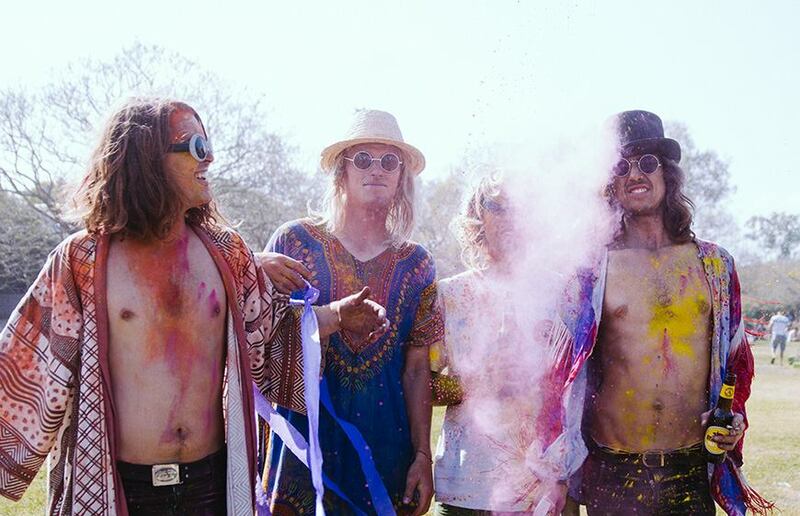 Admittedly, it’s a damn cool name, and although Moses himself passed away in 1993, his name is living on in the form of this Brisbane based psychedelic rock collective. Started in 2009, Moses Gunnn Collective was a three piece consisting of Aidan Moore, Alex Mitchell and Samuel Sargent. The trio started with modest beginnings, claiming they were in a band before they were actually in one. So they did. Moses Gunnn Collective was formed. Moses Gunnn Collective play a distinctive brand of soul-infused psych-rock that has changed and developed as the band fleshed out their sound and direction. While adding new members to the mix as they progressed through their formative years, the Collective are now gearing up for a new release – having spent the past few months preparing new material in addition to their previous album that was written, recorded and released while still a three piece. The evolution of Moses Gunnn has been a slow yet steady progression to their current point. For a band that shares its members with numerous other acts, their output was never going to be prolific. Regardless, their dedication to the project ensures its survival and continual growth with the added bonus of having less pressure to deliver. Their sound has changed over the three and a bit years since they started, which is good, because it exemplifies the desire of Moses Gunnn’s band members to continue to create and produce new music that can stand alone without comparison to their other work. Indeed, the sound of Moses Gunnn is quite dissimilar from that of say, The Belligerents, but Moses Gunnn is far from being some sort of neglected side project. Their first recorded effort, a limited edition release of roughly 200 copies, still shows a considerable amount of effort that was put into the songs, which bodes well for their future release even if it sounds completely different. The 2009 release in question was recorded with the help of Junk Bar owner and former owner of the Troubador, Jamie Trevaskis. Generally, psychedelic music is a hard genre to pin down. The free-forming elements are a constant, but how the sounds are generated and how they sound in the final mix are where things get hairy and hard to describe. Moses Gunnn Collective’s path to their current sound maps like a ‘prototypical’ psych song – a slow build on core repetitions and elements that are then gently built upon until everything comes together in a whirlwind of overwhelming yet coherent noise. The build-up for Moses Gunnn seems to have started with the differing styles of its core members. From the original 3 piece configuration to the 5 piece line-up, Moses Gunnn Collective have added more to the mix to provide themselves with maximum noisemaking potential. When writing psychedelia, it surely helps to have more instruments at your disposal. I have written before that psych music is underappreciated in Brisbane. Maybe that is an untrue statement – psych bands seem to be popping up everywhere now. But when Moses Gunnn started it was still a true statement. It was a bold move for the original trio to jump headfirst into psych. So it seems that the new material will be invading people’s headspace at just the right time. Whether the reasoning behind the delay is a by-product of other musical commitments or just a preference for slowing down the creative process – the gap between drinks means that Moses Gunnn Collective will be releasing their new songs to welcoming ears. Thanks to the apparent ‘delay’ in new material, Moses Gunnn seem to be learning a few things about the process of recording and the importance of a forward thinking strategy. The forthcoming EP sees the band working with a few producers at a new studio, with an aim to increase not only sound quality, but to build an appreciation of professional help. Over a month ago, Moses Gunnn launched a single that was recorded with the help of Konstantin Kersting (also of The Belligerents) at Airlock Studios, owned by former member of Powderfinger Ian Haug. Other songs on the EP were recorded with the help of their previous collaborator, Jamie Trevaskis. Even though Moses Gunnn Collective are on track to bring out their EP this year, they still aren’t in any hurry to put it out. A key difference from their previous release is that they are spending more time on working on the small things that make a release feel complete, something important for a band that plays textured psych music. So fans of Moses Gunnn have probably been waiting long enough for a new batch of songs. I’m sure they won’t mind waiting a little bit longer. I asked Aidan what they key differences would be between this release and their last one. Professionalism aside, Moses Gunnn will benefit from the two and half year gap simply because they have had time to get better. Improvements in instrumentation and imagination are key for any psych band to remain interesting and engaging. While their other projects might be doing engaging things as well, the benefit of having a band like Moses Gunnn is that it provides a creative outlet that removes the restrictions of contemporary indie rock. Perhaps Moses Gunnn is more of a creative outlet for these guys that we all originally thought. One thing is for certain, they are doing things their way. Once the EP is out, what does a psych band do to keep the momentum going? While the Moses Gunnn story isn’t NeverEnding, it is far from finished. The future is exciting for them, so maybe a little bit more of a wait isn’t so bad.